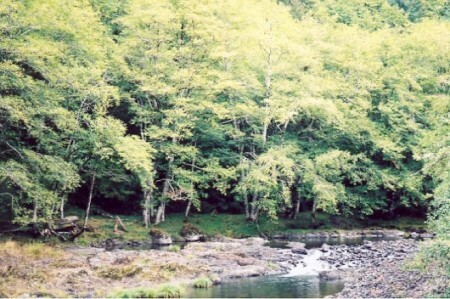 Many years ago I was told, by a steelhead fisherman, about a paradise in the Oregon Coast Range that nobody knew about. He said it was a deep, forested canyon with a clear and beautiful river running through it — and the only access was by walking down railroad tracks. There were deep pools, lovely rapids, high trestles, tunnels, and solitude. There were no trails and only one road — and even that road was pretty much impassable. 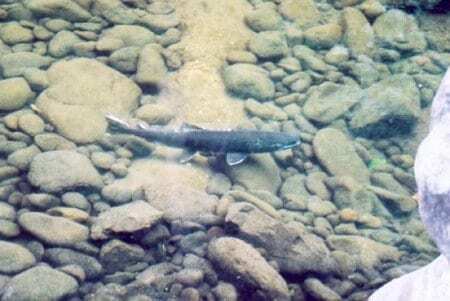 And, he assured me, there were plenty of fish, not only steelhead but also salmon coming in from the ocean and the Nehalem River. 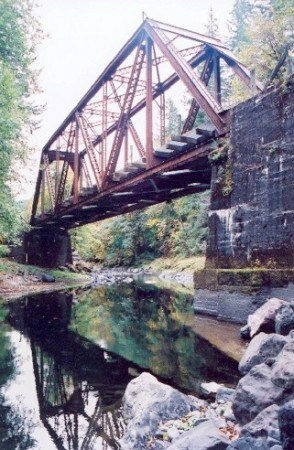 It was called the Salmonberry, and the only access was along the Port of Tillamook Bay Railroad. 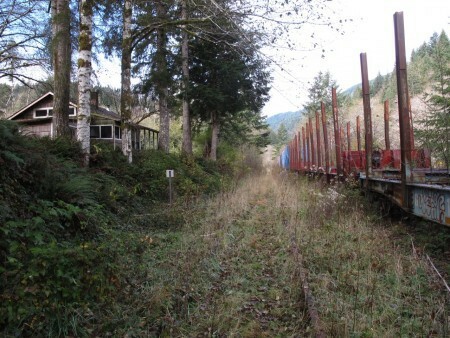 He said the railroad let people walk on it, with certain limitations, so I determined to go see this place. But first I called the Port, which owned the tracks. I was assured that all was well, as long as I obeyed occasional closures (mostly in the summer for fire danger, and always posted at each end) and stayed out of the way of trains. I had a friend take me to the upper end of the canyon, at Cochran Pass, and down the tracks I went, on one of the more magical hiking experiences I’ve ever had. In 16 miles, I saw one other person, a train engineer who gave a friendly wave as he rumbled by — slowly, I was happy to see. Trains are big and loud, and I heard this one coming a long way away. 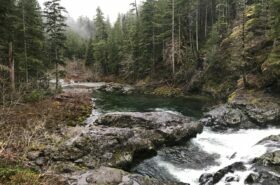 I also saw salmon in the river, rusting bridges, houses accessed by cables across the river, lush forest, and my only giant pacific salamander. 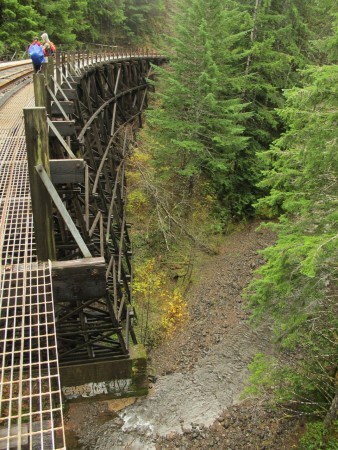 Soon after, I did a new edition of my hiking guidebook, 60 Hikes With 60 Miles: Portland, and I decided to include the Salmonberry, with the disclaimers from the railroad and warnings about trains and tunnels. To my knowledge, it was the first time the Salmonberry had been in a guidebook. In 2007, a massive flood severely damaged those tracks, and it was quickly determined they wouldn’t be rebuilt. 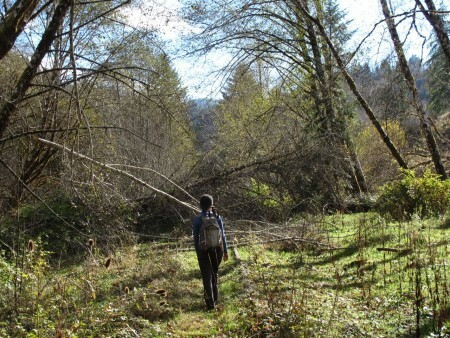 For the next edition of the book I removed the Salmonberry, but then I got wind people were walking it again. 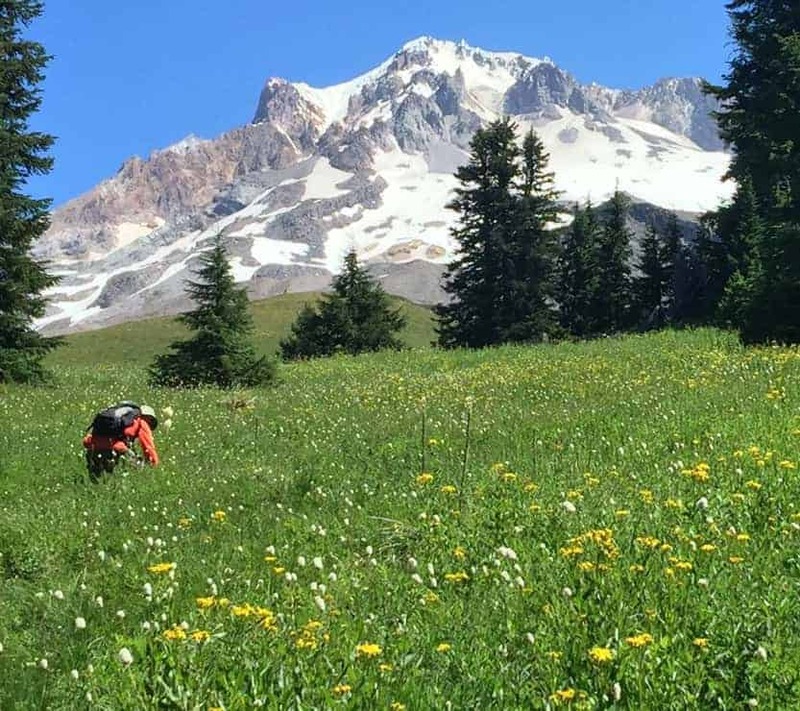 I saw a trip report on OregonHikers.org and decided to check it out. What I found was a whole new kind of paradise. 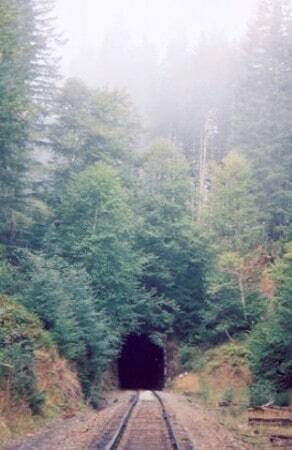 It was the same canyon, the same trestles and tunnels, and much the same river, but this time not even trains. There was nobody, and in fact there was this frozen-in-time ghost town kind of vibe, with several train cars stuck on the tracks, equipment lying around, tracks suspended where the ground had been washed away … It was awesome. This fish were largely gone, their habitat destroyed by the flood, but in their place was a combination of beauty, history and a truly unique hiking experience. Frozen in time, suspended in air. Nature reclaiming the line, 2013. In my mind, I was looking at an abandoned railroad. And since the previous (or so I thought) owner didn’t have a problem with hikers, who would possibly have a problem now? So I put it back in my book, for the Fourth Edition, and it remains in the 5th and current edition. Partly this was also a political act: I had heard the state was considering it as a rails-to-trails project, and I wanted to help that along by raising awareness of the area. Of course, I also enjoyed having another “exclusive” as it were. And it was an amazing experience I wanted others to have. Someday this will be a trail. For now? Closed, I’m sorry to say. And I think I can claim some small part in a wave of interest in the Salmonberry, which now appears in multiple guidebooks as well as newspaper articles and blogs. 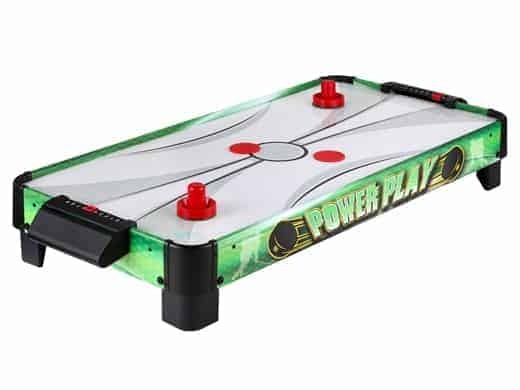 My posts about it on this site quickly became the most popular pages here, getting hundreds of visitors per day. In the last year or so, things have started to change. 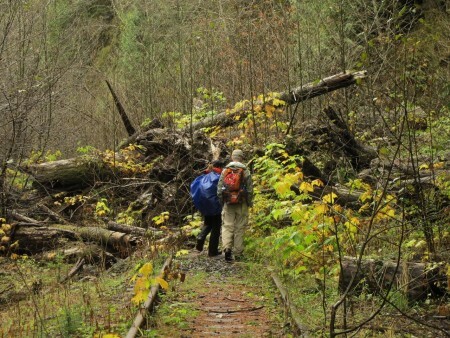 The move to make it an official trail is gaining momentum (see salmonberrytrail.org and salmonberrycorridor.wordpress.com) and all the attention is bringing lots of people to the Salmonberry. Unfortunately, some of them are trashing the place. What’s more, I have to come to find out that it is not, technically, abandoned, even if it will never be a railroad again. The Port of Tillamook Bay still owns it, and they are getting worried about the liability issues around people walking on it. Some local residents are uptight about it, as they are about the possibility of a legitimate trail. And the people with the state who are running the conversion project are clearly concerned about the effects of all these people, and the liability issues, on what they are doing. The bottom line for me, though, is the (still current) owners have asked us not to go. 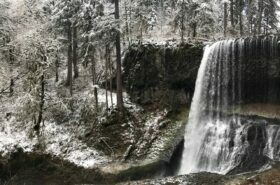 So at this point, I am going to stop recommending to people that they hike the Salmonberry. Frankly, I think the whole liability thing is ridiculous. It hasn’t been an issue, and it shouldn’t be: If you go up there and hurt yourself, too bad. Don’t sue the railroad. This is just my “inner conservative” coming out, but either way, that isn’t the world we live in. The owners (and their lawyers and insurance agents) may be paranoid, but it’s not my business. They own it, they’ve posted it, so I won’t be telling people to go anymore. 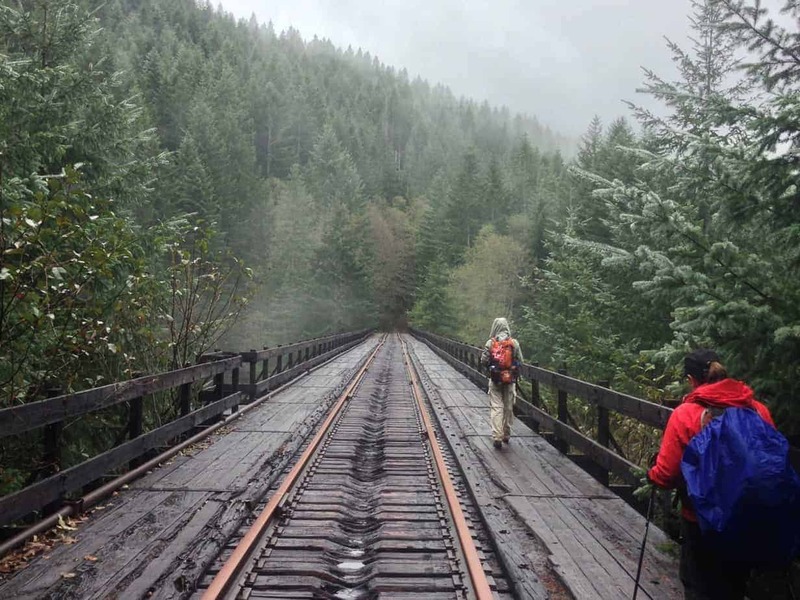 I will, however, encourage people to call the state and the railroad and their representatives and anybody else they can think of and say this: The Salmonberry Corridor needs to be opened to the public ASAP. 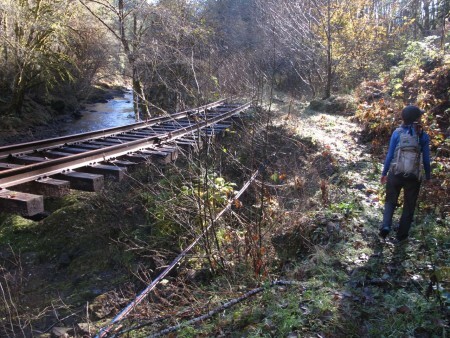 Build a trail, leave the rails, put in a waiver to sign, I don’t care. 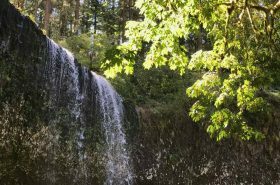 Build the trail from Banks (or even Hillsboro) to Tillamook, put some campsites in the canyon, open it up to hikers and bikers, and work to bring the steelhead and salmon back. I think that paradise can be reclaimed and shared with even more people, and I think it ought to be. I will miss the little-known paradise that used to be, but a real trail through there could be a world-class destination. And if, in the meantime, the right thing to do is quit telling people to go in there, so be it. It won’t be in the next edition of my book, and I have taken all the directions out of my posts here and here. Abandoned (I suppose) cars in the canyon. Call the state and tell ’em to make this a trail! And I hope to see you, someday, on the Salmonberry Trail! Like the “60 Hikes” page on Facebook. I don’t just hike around Portland, though: I’m also working on a book about soccer in England.